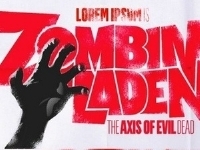 ZOMBINLADEN: THE AXIS OF EVIL DEAD - We need more ham! A brilliant and hilarious faux trailer from a French production house detailing the continuing adventures of the most hated man on the planet, as a ZOMBIE! Notice the "Islam for Dummies" book. How apropos. Now if only we could get this made as a feature. Courtesy of our friend James. Way too funny! I can't wait to see this on DVD!